While I thought The Essex Serpent was a tad over-hyped (sorry), I really wanted to give Sarah Perry another chance with her sophomore novel. 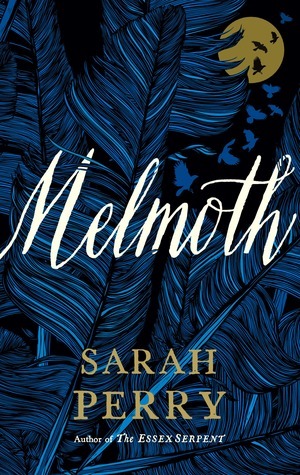 Early in the novel, we are introduced to Helen Franklin, a British translator living in Prague and her friend, Karel, a man who has just shown her a letter regarding a dark-clothed, mysterious female being: Melmoth the Witness. Supposedly, Melmoth is an exile whose presence haunts the guilty, the sinners, and those hiding dark secrets; she desires they join her in her never-ending loneliness and damnation. Karel has compiled a file on Melmoth and seems incredibly perturbed about his research findings. After Karel suddenly disappears, Helen must pick up where he left off – all the while, feeling Melmoth’s presence near her in Prague’s cobble stoned alleys and on the snowy banks of the river. Or is it Melmoth? What is Helen hiding? Immediately, we are drawn into the atmosphere of winter in the Czech Republic’s capital city – Perry’s descriptions of the snowy nights, the jackdaw birds on windowsills, the light hitting the cobblestones, and Helen’s wanderings through the shadows of spires are so well-drawn that you can almost taste the winter air. Perry is an expert at creating the Gothic, slightly creepy atmosphere that readers are expecting, so much so that one almost cannot tell whether the book takes place in the modern day or in the 17th century. I thoroughly enjoyed this aspect of her book and felt like I was also experiencing a deep Prague winter. As Helen further investigates Karel’s folder and the lore surrounding Melmoth, Perry inserts letters, diary entries, and historical flashbacks that tell these stories. Unfortunately, I think only some of them felt complete and relevant, while others just didn’t seem to fit. By the end, it almost seemed that I had read a couple of different books at the same time. So many characters get introduced through these snippets, many of them frankly more interesting than Helen but receiving much less space in the novel. While I did like Perry’s meditations on guilt, sin, redemption, transgression, and secrets, I found the overall plot to be lacking. Because of the unusual narrative structure, I wasn’t as keen on following so many storylines at once. I found that Melmoth suffered from the same problem that The Essex Serpent did: too much going on without enough thematic or plot substance. Lush atmospheric descriptions can only make up for so much. As a less significant criticism, I also found Perry consistently repeated the same Gothic tropes in her descriptions, sometimes word for word – completely unnecessary and at minimum, just distracting. Overall, the book did it’s job of transporting me out of my world and into another, and I think Perry is a master of Gothic style. Gothic substance? Perhaps not so much. Something was just missing here for me. I’ll think twice about picking up Perry’s future novels. Have any of you read Melmoth, or The Essex Serpent, and agree with me? What do you think about Perry’s plays on Gothic tropes? Let me know! ‹ PreviousNon-Fiction November TBR aka I’m Back!